Celebrate this special occasion with a baptism favor! A baptism is traditionally a ceremony where a person is purified with water and initiated into Christianity. In some Christian religions, the baptism of an infant or baby is referred to as a Christening. We will focus on the baptism of a baby or child. Some of the baptism favor suggestions can be used for an adult celebration as well. Cookies. 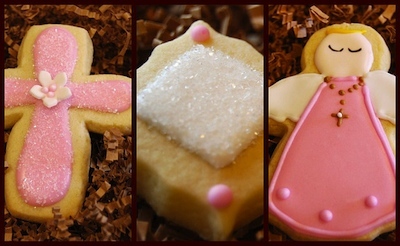 Sweet treats are always a big hit and cookies are a great way to personalize your child's baptism. The decorating styles are endless -- a Christening Gown, an Angel, a Cross, a Bib, a Bootie, a Onesie, a Lamb -- and you can either cut the cookies in these shapes or bake a standard circle or square and create these decorations using icing. Shaped both ways -- cross and angel or simple square with decorations. Cupcakes and Cake Pops. Another sweet treat that your guests will love! Style the cupcakes/pops in the colors of your child's nursery or baptism outfit. Decorate with name or small phrase such as "God Bless." To further personalize, box or bag them up with a tag including the child's name and ceremony date. The pops are so stylish, they can be used as a decoration until the end of the party! Want to learn how to make custom cake pop tags like Kim? Click here for her tutorial! Seed Packets. An inspirational gift to send home with guests! Purchase small seed packets (a favorite flower or seasonal plant) and print labels with your child's name and baptism date. Also include the tag line: "Watch me as I grow in Christ's Love." Guests will remember your little one every time they water their growing plant! Photo Frames. The guests at your child's baptism are all important members of his or her life. They will treasure the chance to take home a picture of the little one! Purchase frames in bulk online or from the Dollar Store. Personalize with a label on the back of the frame with the child's name, baptism date and a "thank you." Prayer Card with Potpourri. So that your little one is remembered and kept in your family and friends' prayers all year round, make little prayer cards to send home with guests. Find a favorite poem, bible verse, or prayer and type it up on the computer. Print it out and glue to colorful pieces of cardstock. Personalize with your child's name and baptism date. Tie using a ribbon to a small cellophane bag of potpourri which you can either buy or make at home. Creative, functional, and memorable! A unique Lamb Favor. Lambs are a really sweet and symbolic item to use as a baptism favor. 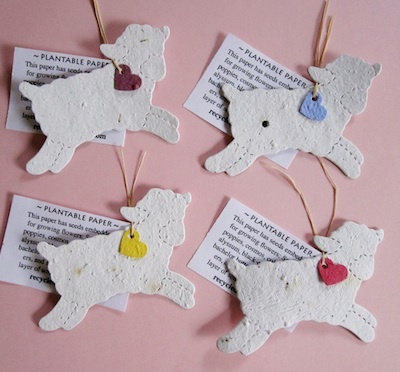 You can use the lamb theme in a variety of ways (cookies, cut-outs, stuffed animals, etc) but here is a truly unique idea for "plantable lambs" we thought you might like! Buy them from Recycled Ideas on Etsy! 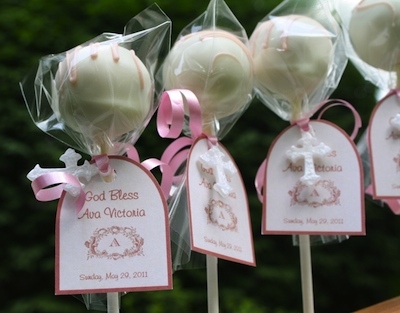 Do you have an idea for original baptism party favors to share? Let us know via our Contact page. Return from Baptism Favor to Home.